Are you thinking about having your very own aquarium? Have you thought about it for years perhaps, but always considered it to be too much of an undertaking or commitment? Countless new fish keepers realise the natural marvel of aquariums every year. Fish keeping offers the unique prospect of not only observing another world but being able to create it! In the process, fish-keeping will teach you about aquatic beings and witness their unusual behaviour first-hand. There really is nothing quite like an aquarium to engender an appreciation and admiration for the environment. An aquarium is, without a doubt, a fascinating addition to any home or office and a welcome source of amusement, edification and stress-busting relaxation for everyone in the family or workplace. 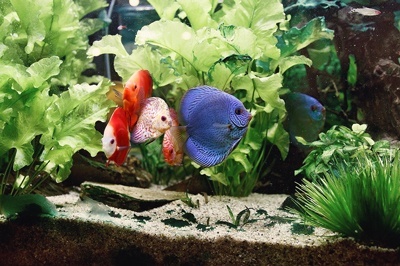 Firstly I should make it clear that the following advice is for a first-time fish-keeper and I am only refering to freshwater aquariums because marine (saltwater) aquariums are not for the beginner and will require a broader level of expertise to successfully set-up and maintain which is beyond the scope of this article. If you regard your fish tank inhabitants as pets, then you will agree that they merit the greatest care and consideration you can give. Your fish trust you to keep their environment healthy. A healthy aquarium is comparatively easy to attain and uphold. Nevertheless, it will not occur by accident. It is contingent solely on you. In the natural world, in rivers, lakes and oceans, water is cleansed and naturally filtered. Obviously, in an aquarium, this is not the situation, and this process requires our intervention. This means we must not overcrowd our tank and we must not overfeed our fish. It means we must change some of the water regularly, clean the gravel bed and provide adequate filtration. If you have just read that and believe that sounds like an awful lot of work would it surprise you that, if done correctly and efficiently it should only take about 30 minutes a week? That is not a significant amount of time to commit to and the rewards, as I hope you will soon discover, are enormous. Substrate: gravel: Coated or pre-washed is ideal or sand. Decorations: Only those labelled for use in aquariums. For example, live or artificial plants and fish tank ornaments. A water Conditioner: this is used to dechlorinate tap water to make it safe for your fish. A good example is “Prime” by Seachem. A simple net: For relocating your fish. A Gravel Washer: The clue is in the name, and it is used during water changes and general cleaning. Fish Food: Of course you fish will need food to survive and what you get will depend largely on the variety of fish you select for your tank. So let us now move on to setting up your new aquarium. Our number one priority is to handle everything with the utmost care and precision. We are dealing with living creatures, and they deserve our complete respect. You should never, under any circumstance, try and move a full or partially full aquarium and never try to lift an empty aquarium with wet hands. Also never try to lift aquarium by grasping upper edges or frame. You should always hold and carry an aquarium from underneath, supporting the bottom at all times. Using a clean, moist cloth, clean your aquarium inside and out before continuing. Never use soap, detergents or cleaning agents. Always place an aquarium in a place intended to support its total weight. Water and gravel weigh approximately 10 to 12 pounds per gallon, so as you can imagine a full, decent sized tank is hefty. An aquarium should always be situated on a flat, level surface near an electrical socket. Never locate an aquarium near a heat source and at no time put the tank in direct sunlight as sunlight can be the foundation of excessive growth of unsightly algae. As a rule of thumb, you should allow 1.5 to 2 pounds of gravel for each gallon of water in your tank. Be certain to thoroughly rinse your gravel until the water runs clear, before adding to the aquarium. The gravel or sand bed should slope gradually from the back of the tank to the front. If you pour water straight into your tank, it will disturb your recently added substrate, so it is recommended you place a clean dish on top of gravel and gradually pour the water over it. This way the stream of water is gently deflected and will not displace your carefully applied substrate. When you add water to your aquarium, it should always be at room temperature. Colder water will produce condensation, which then gives the appearance of leakage. If you do see some condensation appearing, simply wipe the surface with a clean cloth until the temperature steadies. It is of vital importance to always treat tap water with a dechlorination agent before you add it to your tank. Do not If you add plain, unadulterated water direct from the kitchen tap then it will most likely kill your fish. When you have filled your aquarium half way with water, you can start adding plants (live or artificial) and some decorative rocks and ornaments, if you desire. Before adding any items to your tank be certain to rinse them carefully. To create an open swimming area for your fish try adding the larger plants at the rear of the tank and the smaller ones at the front. When you have placed your ornaments and plants, and you’re happy with the arrangement, continue to fill the tank until it is just about an inch from the rim. Many believe that fishkeeping should perhaps be refered to as ‘waterkeeping’, meaning that making the water conditions for your fish favorable to thier needs is the overiding concern. A healthy, thriving aquarium needs correct filtration, and this necessitates three distinct stages. In your aquarium, solid debris such as uneaten food and fish waste is trapped by a poly fibre pad and is what we call mechanical separation or filtration. The second stage is called chemical filtration, and this uses activated carbon to adsorb, attract and hold disbanded pollutants that can cause water discoloration and create an unpleasant odour. These first two stages can be achieved by using a filter cartridge. The third stage is called biological filtration. This requires a culture of beneficial, oxygen-loving bacteria to remove toxic ammonia and nitrite that amass in aquarium water. This beneficial bacteria culture will biologically alter the potentially harmful ammonia and nitrite into nitrate, which is subsequently removed with regular partial water changes. Beneficial bacteria will grow naturally on many surfaces within the aquarium including gravel, decorative rock and plastic plants and will provide biological filtration. A heater may be needed to preserve water temperature in your aquarium. Most tropical fish require a constant water temperature between 75° and 80° Fahrenheit. The exceptions are Goldfish and certain other cold water species as they can exist quite happily in room temperature water. Proper lighting will bring out the natural colours of your fish and is also vital for the growth and vitality of live plants. There are various types of aquarium light fixtures available, and your local aquarium supplies shop will help you select proper lighting. It is also an excellent idea to obtain a hood or cover for your tank (if t does not already have one) as it will help to keep your fish safely inside while preventing airborne pollutants from getting in. It is best, if you can, to limit the lighting of the aquarium to 7-10 hours a day as this will further inhibit the growth of unsightly algae. This can be achieved automatically by obtaining a standard timer socket adapter for the lights. Before plugging in any aquarium electrical equipment, take great care to familiarise yourself with all the safety precautions in the various manuals and be sure to use a drip loop. A drip loop is just allowing the cord to bend down, then back up to the power outlet thereby preventing water reaching the socket itself. Use an RCD protected socket for your power extension. An RCD will protect against electric shock if any water ends up where it shouldn’t be. When producing a new aquarium environment, patience is imperative and ultimately vital to your success. Please allow your system to operate for at least a few days before you start adding your precious fish. Start by talking with your local aquarium specialist retailer about what fish are best suited for your new aquarium, what fish are compatible with one another and how many would be appropriate for the size tank you have. When it is time to start adding your fish only introduce a few suggested fish at the beginning. Then gradually add more over the next four to six weeks. This will help to cycle the tank and build up all the beneficial bacteria I mentioned earlier. Select only fish that appear active and healthy. Be cautious not to overcrowd your tank. It is far better for you, your aquarium and above all else, your fish to have fewer, healthier fish than too many. Be certain that the water you place your fish into is as close as possible to the same temperature as the water they leave. To equalise the two temperatures, float the transport container (which is usually a plastic bag) in the aquarium for about 15 minutes. Then, at five-minute intervals, open the bag and add a small amount of the water from your aquarium. Lastly, after around 15-20 minutes, gently net the fish from the bag. You should try to avoid adding any of the water contained in the bag itself to the aquarium as it may contain unwanted or harmful bacteria or parasites. Allow the fish to swim free from the net after you have submerged it. Remember the less stressful the transport, the better it will be for your fish. Remember to only feed your fish twice a day, despite how tempting it may be to spoil you’re new found friends and only provide what they will consume in around five minutes. Now that your tank set-up is complete we should move on to how you maintain your new aquatic environment. First and foremost always make certain you have unplugged all the aquarium electrical equipment before performing maintenance of any kind. Remember a correctly maintained aquarium filter means cleaner water and, of course, healthy, happy aquarium inhabitants. You should replace your filter cartridge and execute a 25% water change every 2 to 4 weeks. During this time you should also vacuum the gravel methodically to remove any waste build-up. The stress-free and most efficient way to achieve both a water change and gravel cleaning is by using a standard, siphon-operated gravel vacuum. Water that looks hazy has a yellow tint or has a bad odour is long overdue a change and needs a new filter cartridge straight away. If the water quality issue continues, it could be because of overstocking (in other words your tank contains too many fish for its size) or maybe you are simply feeding your fish too much, too often. If you are unsure, you can take a water sample to your local aquarium specialist shop who will be happy to test it for you and offer some advice. Before adding fresh water to your aquarium make certain you to treat it. Almost all tap water contains chlorine or chloramines, and, as I alluded to earlier, adding untreated tap water directly into your aquarium could seriously cause considerable harm your fish. To avoid stressing and potentially damaging your fish make sure the water that you add to the tank is approximately the same temperature as the water you removed. Keep handy an assortment of sponges, towels and buckets that are strictly for use only with your fish tank. This will assist in preventing the introduction of harmful pollutants into the aquarium eco-system.